This is the last of the liter on Halloween cards for this year. I actually made two more but doubt if I'll post them. It's not even October yet and I'm already tired of Halloween! Yep! Not my favorite time of year but I do like to make a card to send to the grands. I got them done early this year too! Whoop!!! I know this is terribly clean and simple but it just is what it is. 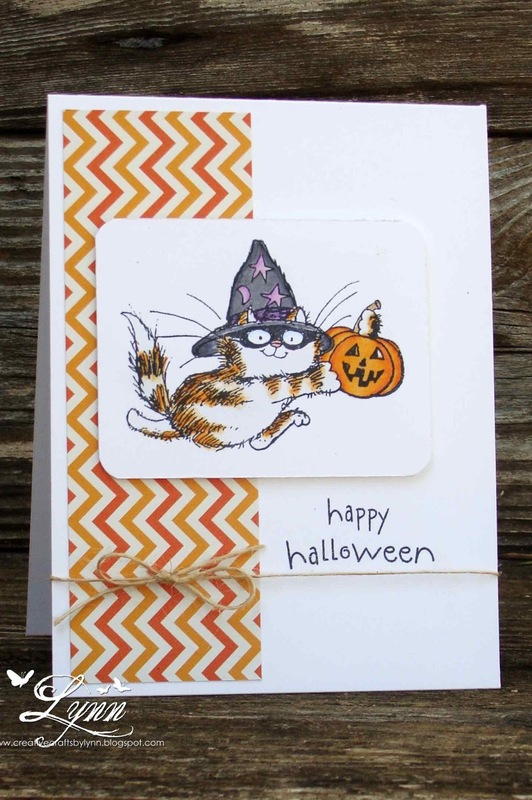 I used a Penny Black stamp (that I think is entirely too cute) and a scrap of Halloween type patterned paper. A bit of twine, the sentiment, and it's a done deal. Also going to try something a little different around here too. I'm spending more time looking at everyone's blogs, commenting, wishing I could do that, and not attempting to do any crafting! So, it's time for a change. I'm busy enough as it is with Jim most days and things that have to be done around here, so I'm going to pull a disappearing act. Maybe I'll get some mojo and make a couple of cards in the next few days then. I'll see everyone when I see you again. I know I'm going to miss some wonderful creations, but feel I just have to do this for myself. It's all just gotten a little overwhelming. I've tried to keep up with everything but it just isn't happening any more. Hope you understand. 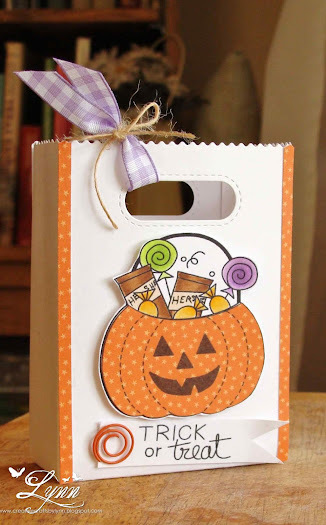 Since all the grands are far away I never do treat bags for Halloween. This year, however, I thought I give one to Jim. Figured he needed a 'pick me up' anyway. Oh, and by the way......he's doing pretty good I guess. About the same but we're making it from one day to the next so what more can you ask for. Some days are VERY long but we keep rocking along. Using the Goodie Bag die from Lawn Fawn and a cute FREE image from Newton's Nook, I created a small treat bag. I colored part of the image with Copics and then also did some paper piecing. We've got lollipops, butterscotch, and two Hershey bars in the pumpkin. I'll put a real Hershey bar in the bag before giving it to him. If I do it now, he'll eat it! The little ring thingy on the sentiment is some type of wire clip I found hiding with my brads. 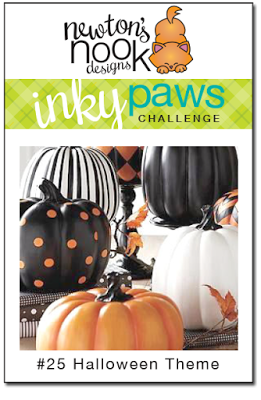 I'll enter this in the Inky Paws Challenge at Newton's Nook (Halloween Theme). I'd also like to enter it in the challenge at Whimsy (Anything Goes or Halloween) and Die Cuttin Divas (Pumpkin or Scarecrow). I've pretty well decided that you either love those Crazy Birds from Tim Holtz - or you hate them. I, for one, love the little guys. They're just so cute with their funny expressions and I really think I get some of the same expressions from time to time - especially with Jim! This witch-y bird is grounded and won't be flying on Halloween night and by looking at the expression on his face, he's really having a hard time understanding that. I personally think he could be a little too chubby to get in-flight. He's colored with Copics and then I added some spots with the Colorless Blender and also some dots with a Gel pen to his wing that has been popped up. 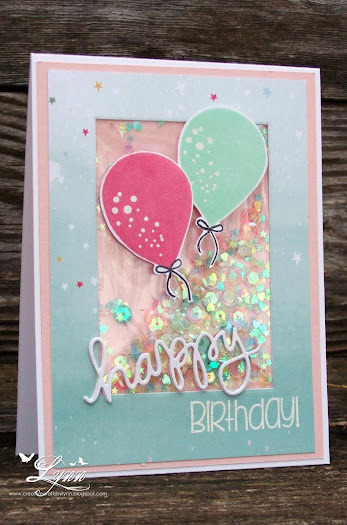 I used the Polaroid die from Lil Inker along with embossing on part of it. The sentiment is from Paper Smooches. Sequins, patterned paper, and some Baker's twine finish up the card. 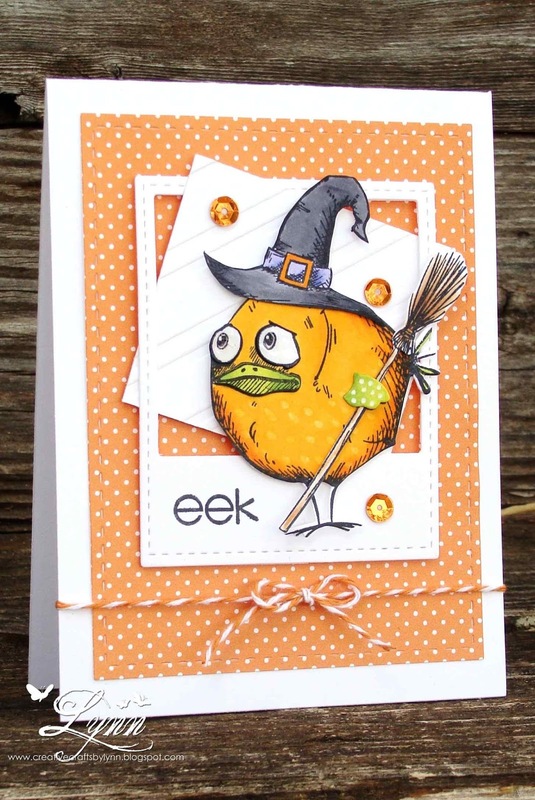 I'll enter this in the challenges at Really Reasonable Ribbon ("Orange" you glad it's Autumn), Whimsy Stamps (Anything goes or Halloween), and Pixie's Crafty Workshop (snippets). A little bit of not real scary boo today! I'm the worlds worst when it comes to making Halloween cards and then getting them mailed on time. I usually wait until the week before and then rush around trying to do them for the grand kiddos. Most of the time I just say to heck with it and save them thinking I'll send them next year. Of course when 'next year' finally gets here I forget I have them and then rush around again trying to make more. Ah......such is life! So.......this year I decided to make them early, get them stamped and addressed, and maybe even stick them in the mail before Halloween! I used an 'older than dirt' CTMH Halloween stamp (Hocus Pocus) on this doing a little masking in order to get the fence in there too. The clouds were sponged in with some Hero Arts Shadow ink. The ghosts were stamped, cut out, and popped up. 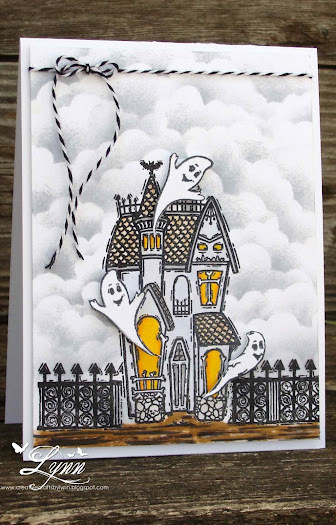 I love the smiling faces on the ghosts - and that makes it a not real scary boo card. They remind me of Casper the friendly ghost! I just loved that little guy. This will be my third and final entry in Darnell's NBUS challenge. A fun challenge with already a slew of entries! Although I've used the ghosts and house before on a card I've never used the fencing - mainly because I never could get it to stamp right. Enter the Misti, and the fence was a breeze! I love all the colors of the seasons, but Fall has to be my very favorite. We don't see very much Fall type temperatures around here - but maybe we will this year. 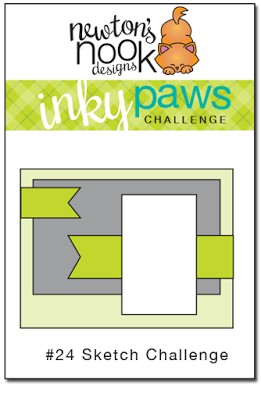 This cute little image can be found at From the Heart Stamps for their monthly progressive challenge. I added some patterned papers and a leaf die from Impression Obsession that was sponged in distress inks. Also did a little sponging around the image after coloring it with Copics. I'd also like to enter this as my second entry in the NBUS challenge that Darnell is having. Thanks for stopping by........and have a great weekend! On the wings of a butterfly.......Sorry I haven't been around much the last couple of days. I'll catch up soon with everyone. I did this card a while back but never got it posted. 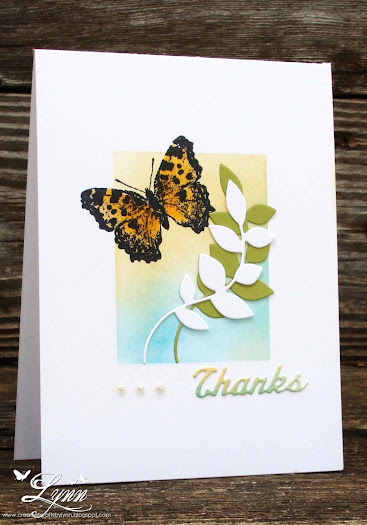 I used a new stamp recently purchased from Stampendous and also a newly purchased Sizzix leaf die. I sponged in some distress inks inside the masked off square and also on the "thanks" die. A few pearls were added and it was a done deal. Of course, looking at it now I wish I'd added another die cut of the leaves in green on top of the white one and also wish I'd stamped the butterfly again and popped it up a little. Oh well...........That's typical of me to re-think my cards when I get them finished. It just is what it is though. Since Darnell is having her 5th NBUS challenge I think I'll scoot this card over there and I'd also like to enter it in the challenge at Pixie's Crafty Workshop (snippets). Ok, blues are actually green, and pink is something else besides this....and would someone please tell me how to take a picture of a shaker card and not have the glare! I finally made a card I halfway like and then can't get a good picture of it. Too much glare entirely. The design paper is also the same color as the green in the balloon and that pink that's appearing is just down right nasty looking! Oh well.... It was a fun card and think the granddaughter will like shaking it. Probably going to like the money inside better though!!! 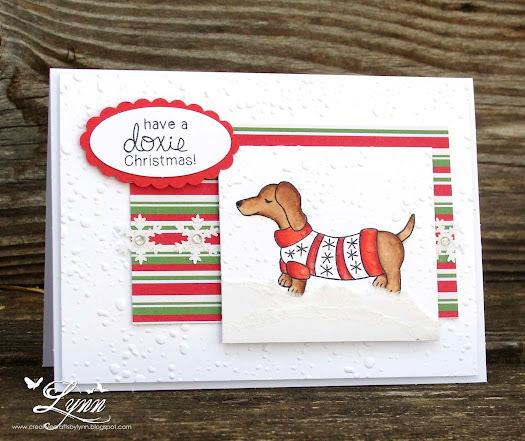 A doxie and a doxie.....This first one is from Newton's Nook and the set of stamps is called Holiday Hounds. I used a Sheena Douglas snowflake embossing folder and lots of white!! I wanted that cute image to really pop out on the card because I love it so much. I also added some torn paper in slightly different color white for the 'snow' on the ground, some punched out snowflakes with gems in the center, and then of course, the sentiment. Don't you just adore the look on this little guys face. The second doxie.......well, is Rambo of course! Maybe they're brothers....or brothers and sisters. No matter since I love both of them! I may have posted this picture of the little man before but if I did, you just get to see it again! My card is for the Inky Paws sketch challenge at Newton's Nook. I'd also like to enter it in Pixie's Crafty Workshop (snippets).